P21S cleaners are known around the globe for their world-class quality German formulations that were originally created for OEM applications. You can rest easy knowing P21S is safe and effective to use on your Porsche as they are used by German dealers worldwide to clean vehicles when they arrive at the dealership- and now you can receive 10% OFF all their products when you enter promo code POLISH10 at checkout. 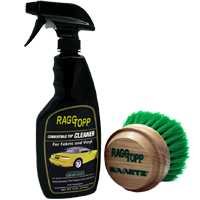 RaggTopp Products are designed for auto-care professionals and home detail enthusiasts who demand the very best convertible top cleaners & protectants. All of their formulas are guaranteed to not harm any of your P car surfaces. Enter promo code RAGG20 at checkout to receive this discount offer! CLICK HERE to purchase RaggTopp! CLICK HERE to purchase P21S!